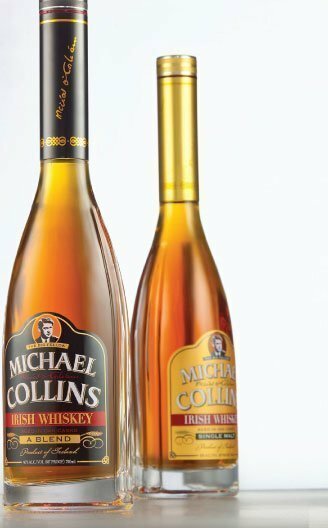 Michael Collins, epic hero of modern Ireland, naturally deserves a whiskey bottled in his honor. Here’s a look at Michael Collins “A Blend” (there’s also a Single Malt version available). To consider the rich amber color of the whiskey you’d think you’re in for something hefty (check the photo below — the bottle itself is clear! ), but on first nosing and sipping that’s clearly not the case. Collins is light as a feather, a honey and caramel whiskey that tastes considerably younger than the four to twelve years this spirit spends in bourbon casks. Note that you can find a gift box of this whiskey with a golfer’s kit and flask for the same price as the bottle solo.